Léger commonly painted several different variations on each of his pictorial ideas, and many of the same elements in this painting appear in four others, arranged in similar interrelationships. Aside from what appear to be rods, wires, and the stenciled letters P, U, and V (presumably taken from some poster or sign observed on the street), it is impossible to identify specific objects. Judging from Léger’s more explicitly representational works of the immediate post–World War I era, however, the colorful fragmented and segmented forms, all geometrical in outline, are most likely related to elements of modern machinery and architecture. 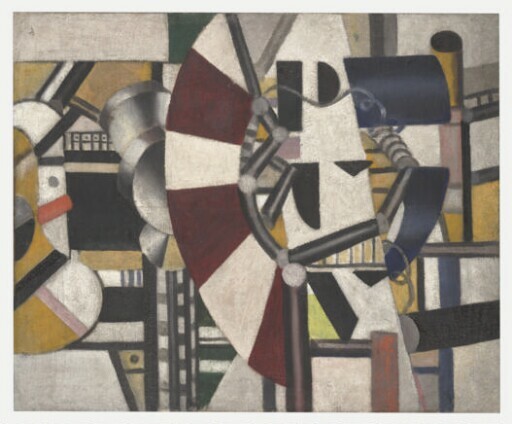 Already before the war, in a lecture presented in Paris, Léger stressed that condensation, variety, and fragmentation were the essential visual qualities of motorized, commercialized, twentieth-century experience and hence of modern painting. The work remained in Cendrars’s collection until acquired by the Kimbell in 1985. As a result, its condition remains pristine; never varnished nor relined, it provides a benchmark for understanding the delicate textures and matte surfaces essential to Léger’s aesthetic. purchased from (Ellen Melas Kyriazi, Lausanne) by Kimbell Art Foundation, Fort Worth, 1985.